The leader of the Coptic Church, Pope Tawadros II, accompanied by several bishops, priests and deacons, welcomed the 20 coffins at the Cairo airport on Monday evening, 14 May, with prayers and Coptic chants. 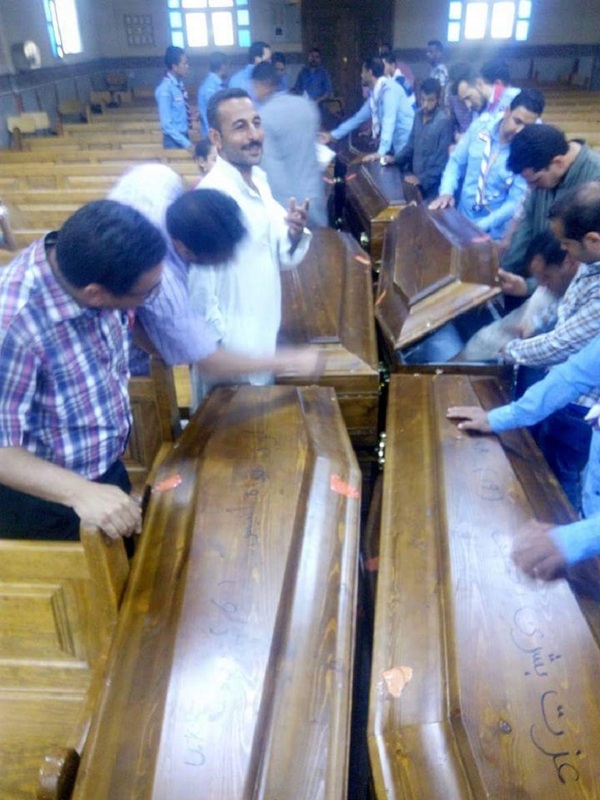 Yesterday, 15 May, the families gathered at the church, where the remains of the 20 Copts were placed in one large coffin to be buried in the chapel. 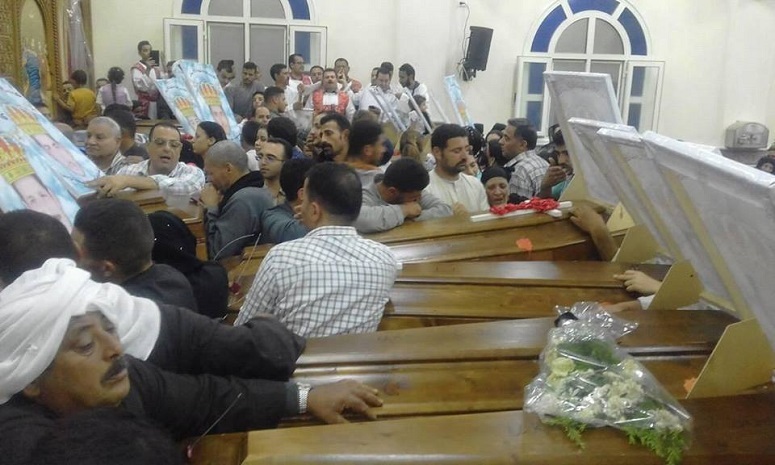 Thirteen of the dead came from Al-Our, the seven other Copts from other villages in Minya. 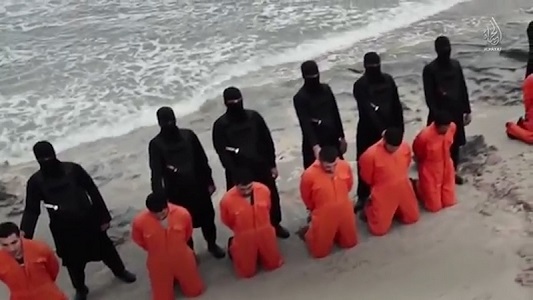 Along with the 20 Copts, one Ghanaian Christian had been abducted and beheaded by IS in Libya. World Watch Monitor has learnt that his body was handed to the Ghanaian Embassy in Libya. 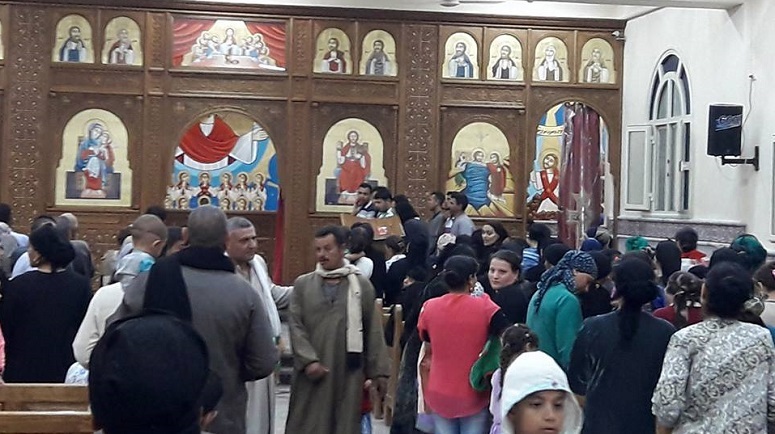 A morning Mass was celebrated by Bishop Bovnotious of Samalut; Bishop Ermia, General Bishop and President of the Coptic Orthodox Cultural Centre in Cairo; Bishop Botrous, General Bishop of Shebin El Kanater and its territories; and more than 40 priests who had arrived from different areas. Many residents of Al-Our and nearby villages also attended the Mass. The Governor of Minya, the province’s Security Director and some local members of the Egyptian Parliament were also present. Libyan authorities announced the discovery of the men’s remains last October. Prior to the bodies’ repatriation, forensic samples were taken from them and sent to Egypt, to be compared with DNA samples taken from relatives of the 21. After scientists concluded that the bodies were those of the mainly Coptic group, the head of investigations at the Libyan Attorney General’s Office ordered on 5 May that the remains of the victims be transferred to Egypt. Fr. Youssef Ayad Attia described the day of the bodies’ return as one “engraved in history with golden letters”. On 11 March, the families of the victims designated Fr. Maqar Issa and the lawyer of the Samalut Diocese, Attallah Youssef Hanna, to complete the necessary paperwork on their behalf at the National Security Agency in Cairo for the bodies’ return. The families were told that upon successful completion of the documents, the bodies would be returned to them within ten days. The 21 victims, all daily labourers in Libya, were captured in two separate abductions by armed militants on 29 December 2014 and 3 January 2015. The hostage-takers had first confirmed what religion was written on their ID cards, before taking the Christians hostage and letting Muslims go free. 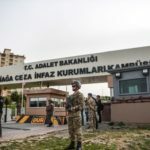 The defendants in the case are due to appear before the court after Ramadan, which ends on 14 June.